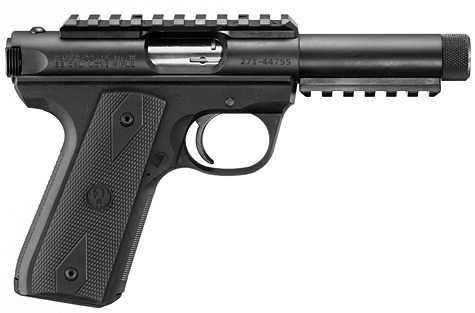 Ruger has apparently been listening to all of the suggestions coming in from Steel Challenge shooters as well as other aficionados of their 22/45 and began production of the pistol with factory installed rails and a threaded barrel. The new 22/45 comes equipped with a 10-slot rail on top and a 6-slot rail under the barrel to allow for easy installation of a holographic sight on top and a laser, flashlight, or other accessory on the under-barrel mount. The barrel is also factory threaded 1/2×28 to accept a suppressor or other .22 caliber muzzle device and includes a thread protector.